I’ve watched the legal lead generation site LawDingo with a level of interest over the past year or so… the company matches prospective clients with an attorney in real time via phone or chat. This is obviously the direction the industry is moving – as people expect expertise on demand. Avvo’s foray into Avvo Advisor – which promises “a great attorney on the phone in minutes” is the other big example. I personally believe the future of legal involves technology bringing lawyers increasingly close to new clients who wouldn’t have otherwise been able to afford counsel. 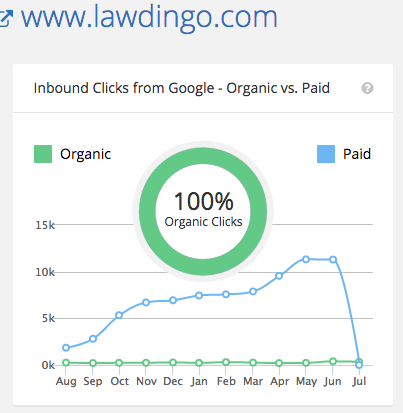 But LawDingo was in a tough spot – watching them early on they relied intensively on PPC arbitrage – i.e. buying leads through Adwords/Bing and then selling access to those leads to attorneys via a monthly subscription. This business model is extremely difficult to maintain – especially in legal, where lawyers implement irrational (read: unprofitable) bidding tactics in their irrational desire to “win” SEM. And for LawDingo, as a lead generation service, the upside value of those PPC clicks is much lower than for an attorney who can gain a new client. The other option – SEO driven traffic is an extremely expensive undertaking. So – from a pure economics perspective, I thought it might be tough for LawDingo to make a go of it. Because of these economics, I’ve never had a client on LawDingo (i.e. why pay a vendor to pay a advertiser, when you can go directly to the advertiser), but I’ve been curious to see how this direct access to attorneys model performs.